Here is some of our latest planted milo in the county that are approaching 5 leaves. I’m mostly seeing pigweeds come up now. With Concept treated seed, most growers applied either Dual or Warrant pre-emergence and come back with Atrazine post. I’ve been asked about post-emergent herbicide timing. 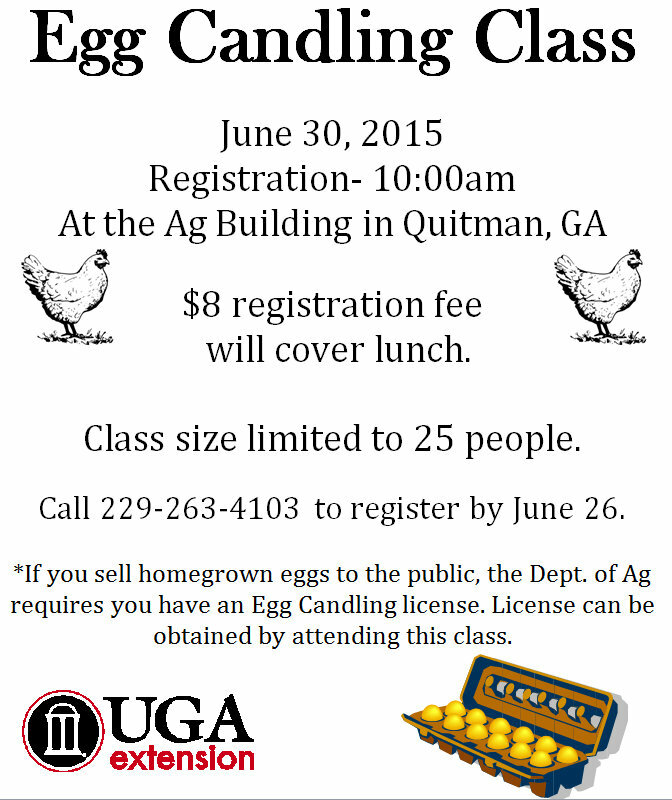 UGA Extension Weed Scientist Dr. Eric Prostko says with sorghum, just check the leaves coming out of the ground. Once we have 3 leaves, it is safe to spray Atrazine as our post emergence. This can be done from 3 leaf until 12″ tall. 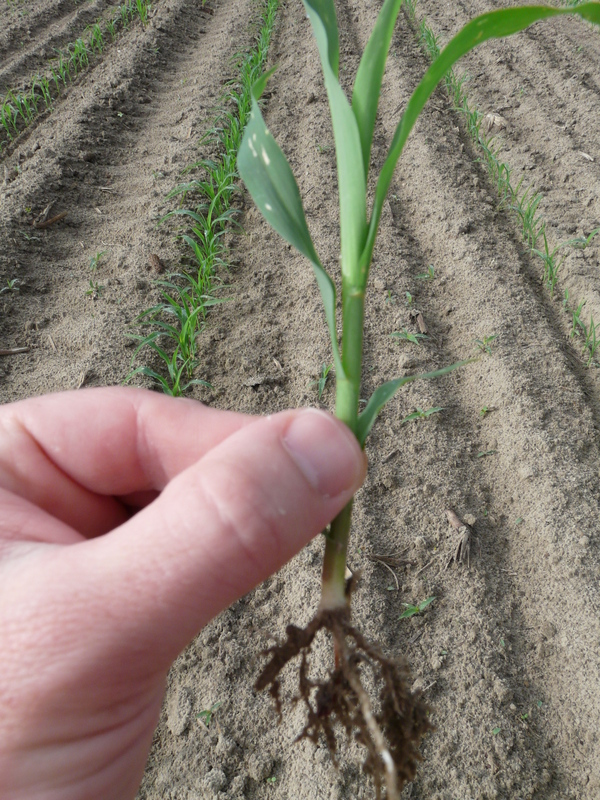 If nutsedge is an issue, Basagran can also be sprayed between 1 and 5 leaves and tank mixed with Atrazine. Replace 1.5 pt/A chlorothalonil with 15 fl oz/A Elast. Replace 1.5 pt/A chlorothalonil with 10 fl oz/A Topsin/thiophanate methyl, but ONLY one time! Replace 1.5 pt/A chlorothalonil with 5.5 fl oz/A Alto + 5 fl oz/A Topsin/thiophanate methyl. Extend chlorothalonil with 1.0 pt/A chlorothalonil with 1.0 pt/A Kocide. Extend chlorothalonil with 1.0 pt/A chlorothalonil with 5.0 fl oz/A Topsin/thiophanate methyl. Extend chlorothalonil with 1.0 pt/A chlorothalonil with 2.0 fl oz/A propiconazole. Our earliest planted corn has tasseled and silking at this time. I’m seeing stink bugs move into corn as wheat is being harvested. 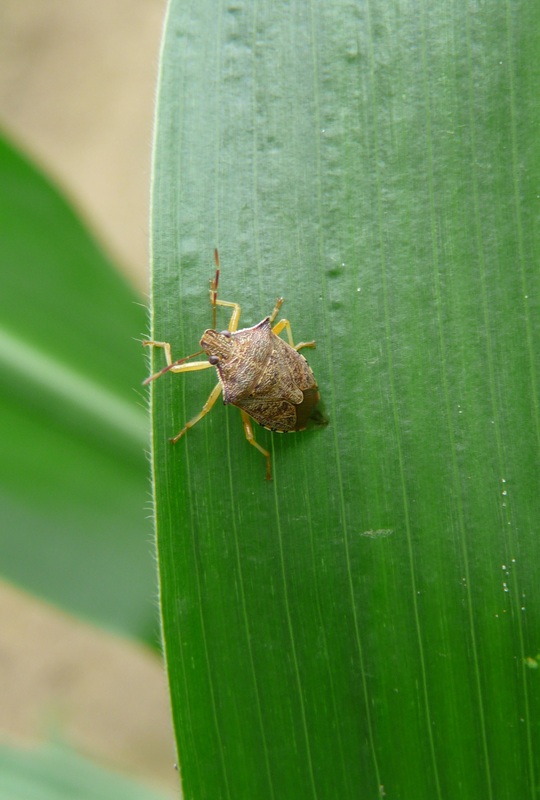 Stink bugs can cause the greatest amount of damage when the ear first pollinates. With piercing mouthparts, they feed through the husk and damage kernels. Their feeding injury usually deforms ears into a C or boomerang shape. The ears do not develop properly and may be more susceptible to infection by diseases. Here is a hatch out of brown stink bugs I found on a leaf this week. We usually see southern green, green, and brown stink bugs. Each of these species have similar behavior at hatching. They tend to remain clustered on the egg mass unless disturbed. 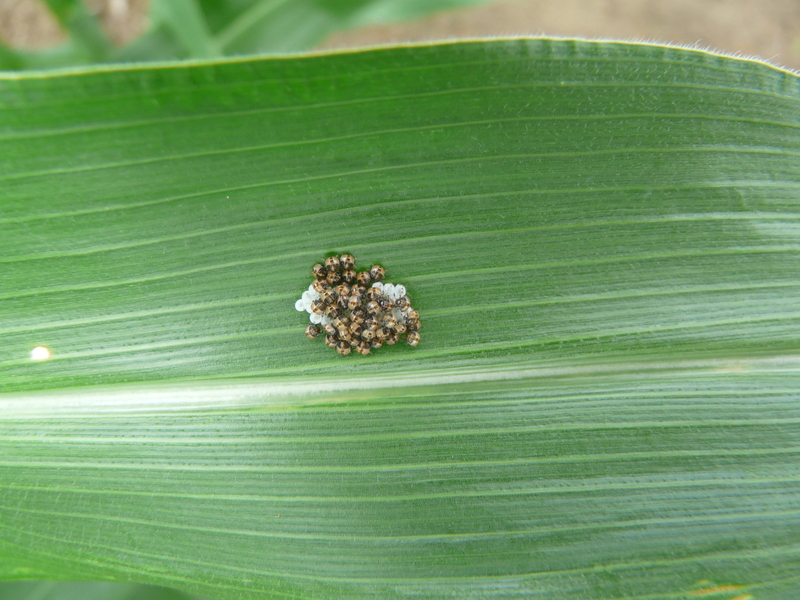 They do not feed on plant tissue at first instar. 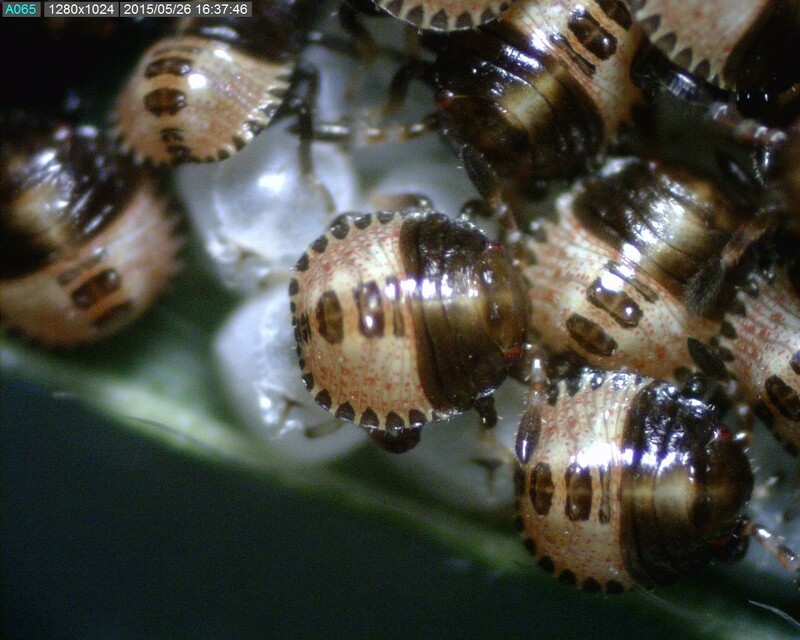 Immature brown stink bugs are yellow to tan, with brown spots down the middle of the abdomen. We’re planting irrigated cotton fields this week. Topsoil is drying out even after a few inches of rain a week ago. 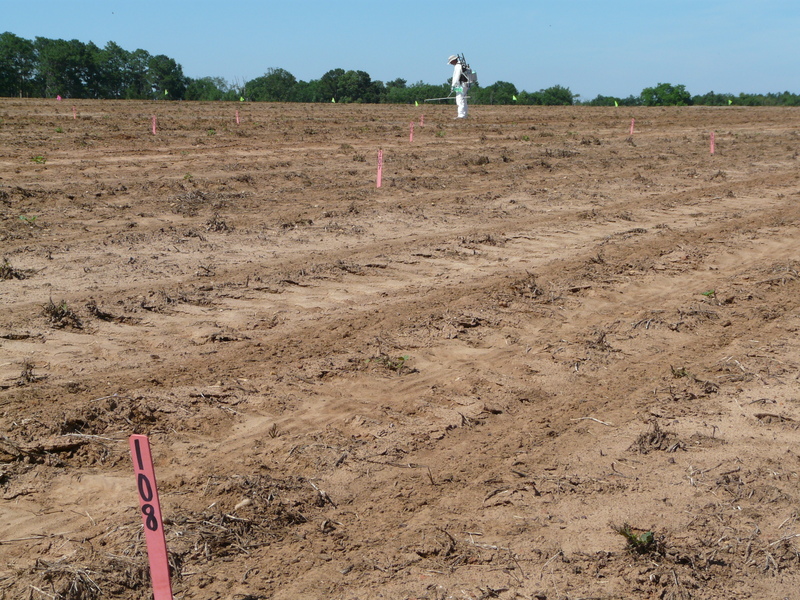 UGA Extension Cotton Weed Specialist Dr. Stanley Culpepper was down putting in a small trial hoping to determine cause of herbicide injury in a field. This field has seen persistent injury where soil type could be a factor. We were also discussing the timing of our pre-emergence herbicides and getting the herbicides activated following planting. Here are steps from Dr. Culpepper to decrease herbicide injury. Plant high vigor seed into moist soil (preplant irrigation often needed). Shallow planting depth increases injury potential. Apply proper residual herbicides withint 24 hours of planting. 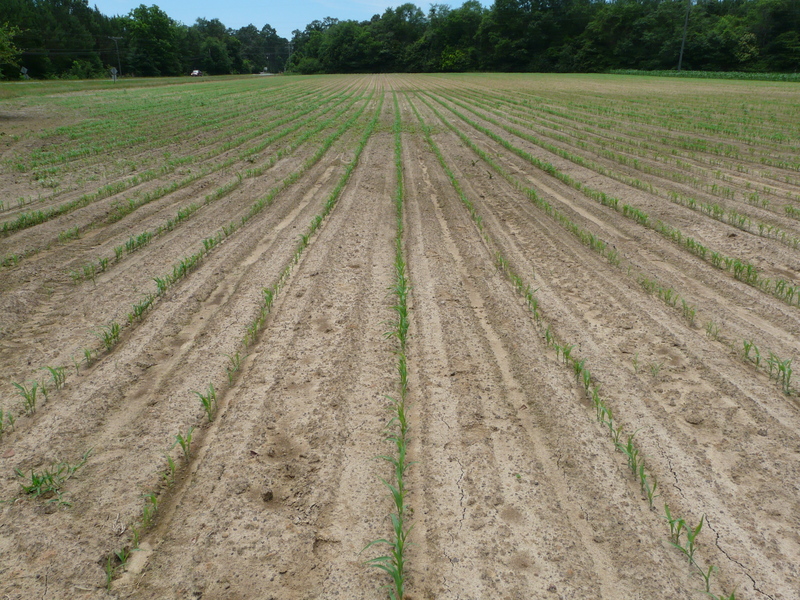 If feasible, irrigate between 30 hours after planting and prior to 24 hours before emergence, but then do not irrigate again until at least 5 days after emergence. 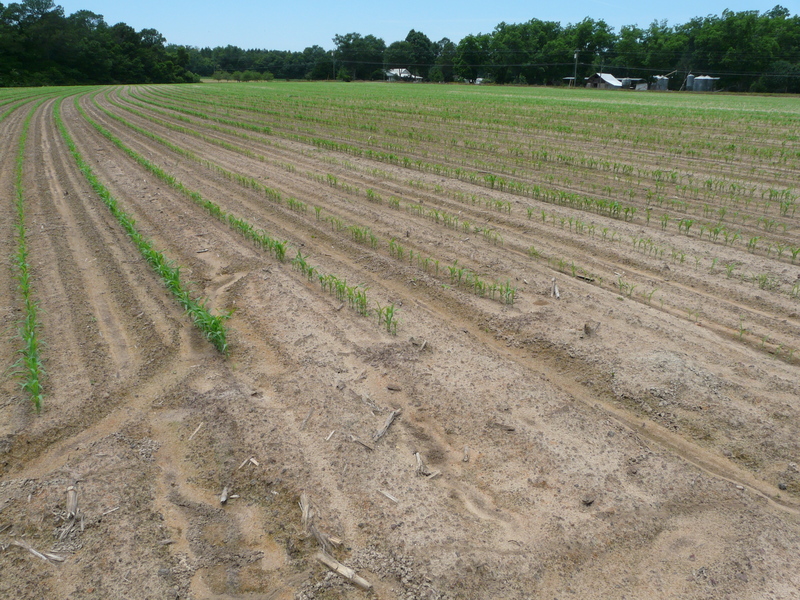 irrigate to develop a perfect cotton stand; however, limit irrigation events during the first 2 weeks after planting to as few as possible after activiating residual herbicides. I am seeing nuts forming on trees in Thomas County and dry weather has helped lessen scab severity. All orchards have sprayed two or three times by now – some more. Here are some notes from UGA Extension Horticulturalists Dr. Lenny Wells on some issues he has had calls about in Desirables. We may observe leaf drop and bark flaking, but this is not much concern. I get calls every year about ‘Desirable’ pecan trees on which the bark is peeling off or sloughing off in large chunks. While it occurs on other cultivars, this is a common occurrence and yet another quirk of ‘Desirable’. When trees grow in diameter the older, outside bark can’t stretch. 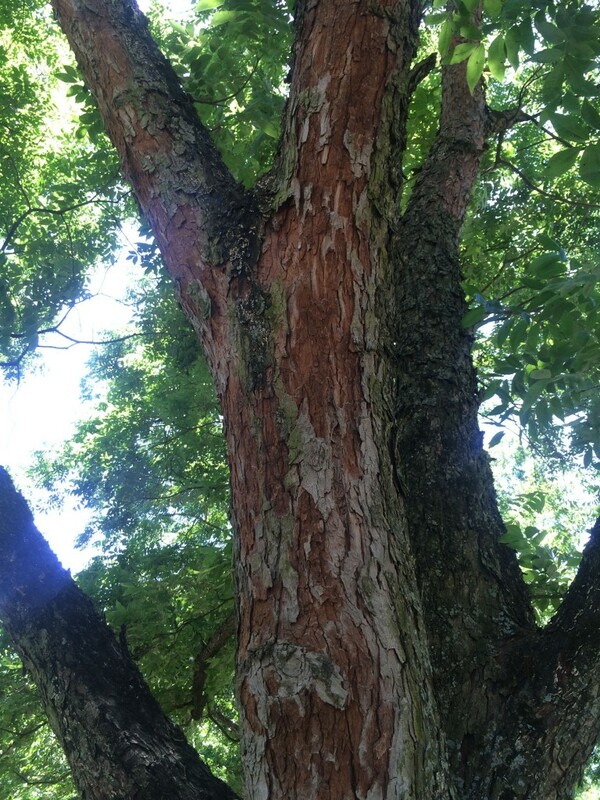 This is why, on younger trees, the outer bark cracks as they grow. The shape and pattern of these cracks are genetic traits of the tree and varies by cultivar. Older trees with scaly bark simply slough off bark. This process is helped along at times by woodpeckers searching for a meal of insects under the bark. When large chunks of the bark slough off, it can be alarming to see, but it is nothing to worry about. This is simply a natural part of the tree’s growth process. Its just the outer layer of bark coming off, revealing a cinnamon-colored younger bark below, which will eventually take on a normal appearance as the tree continues to grow. This is often confused with lightning damage. As long as the bark doesn’t come completely off, revealing the wood (which will have a smooth, white appearance) underneath, the tree is fine. I’ve also had a few calls in the last day or so regarding the dropping of leaves from ‘Desirable’ trees. This is an annual occurrence and is a physiological condition we see more pronounced when there is a fast change in environmental conditions as we’ve seen recently with a shift from cool and wet to hot and dry weather. ‘Desirable’ is more sensitive than many other cultivars to this and many other problems. Last year, this occurred in early June but the tree’s foliage/crop development as well as the shift in weather conditions has occurred earlier this year. This is something that seems to happen every year. Much of this minor leaf shed is simply the dropping of shaded leaves in the interior of the tree. A good, look at ‘Desirable’ trees often reveals a fair amount of bare limbs on the interior of the tree that the tree simply self-prunes. At any rate, this early summer green leaf drop by ‘Desirable’ is largely inconsequential and doesn’t really pose a problem. It is simply a physiological response of the tree and is not related to a nutritional problem. It occurs each year and if you do not notice the defoliation when looking at the tree from a distance, but only see it when you look under the tree, there’s no worry. Growers with ‘Desirable’ in 2014, have more to worry about in the form of scab than they have in a minor leaf drop. I was asked to look at some corn with leaf spots yesterday. 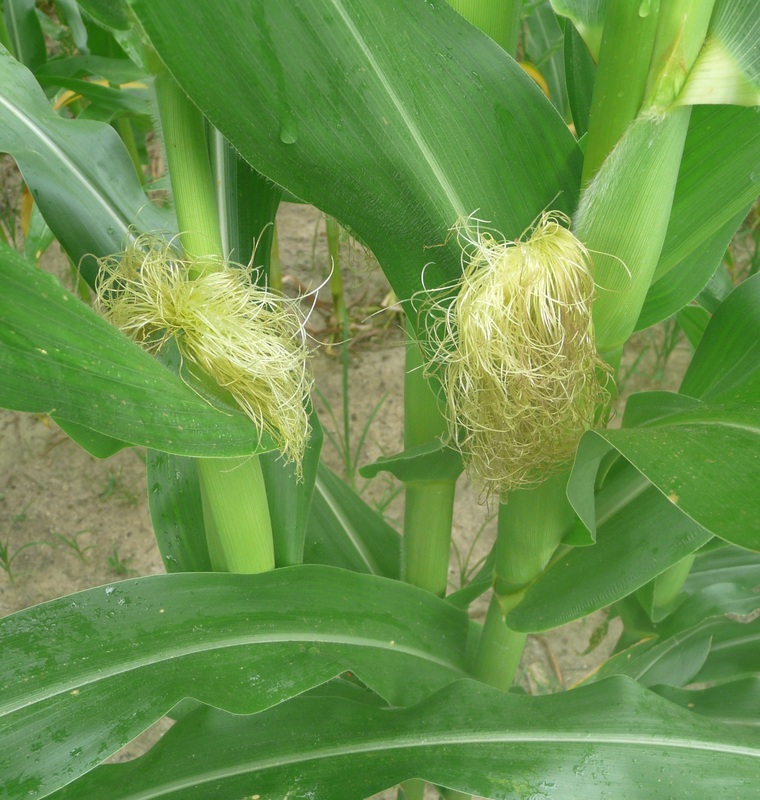 The corn is tasseling now and actually silks are coming on the ears. 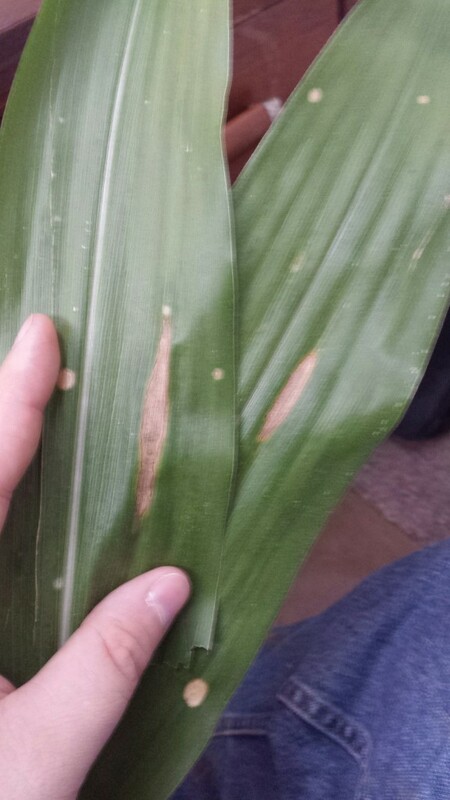 I’ve been seeing these spots on all corn all across the county for some time as I check for disease. The spots I am finding are from herbicide drift and nitrogen burn – mostly herbicide. These are small, yellow spots on leaves from top of the plant down in the canopy some. I have yet to find disease but Northern Corn Leaf Blight has been seen at low levels by Seminole County Agent Rome Ethredge and Terrell County Agent Nick McGhee. 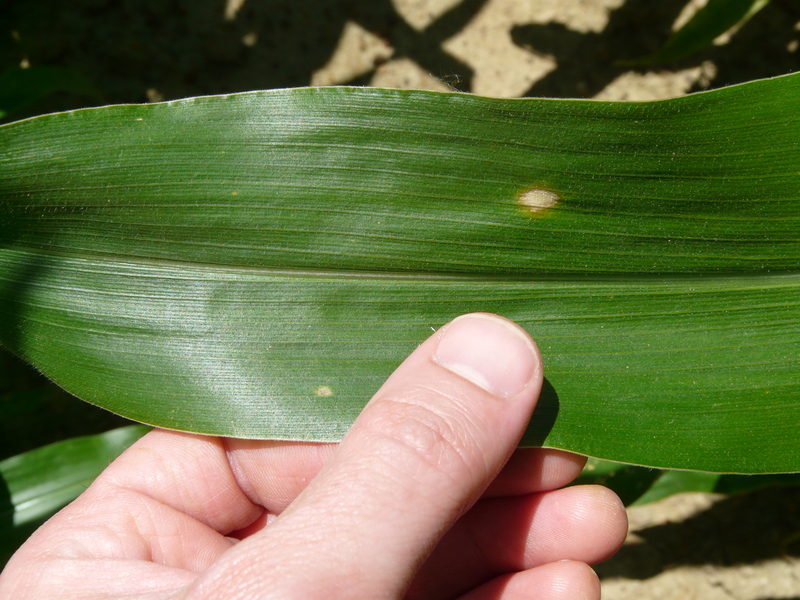 NCLB will have a cigar shaped lesion usually on lower leaves and is generally found in corn with tight rotations – especially corn behind corn. There are other leaf spots I am seeing but are of no concern also. 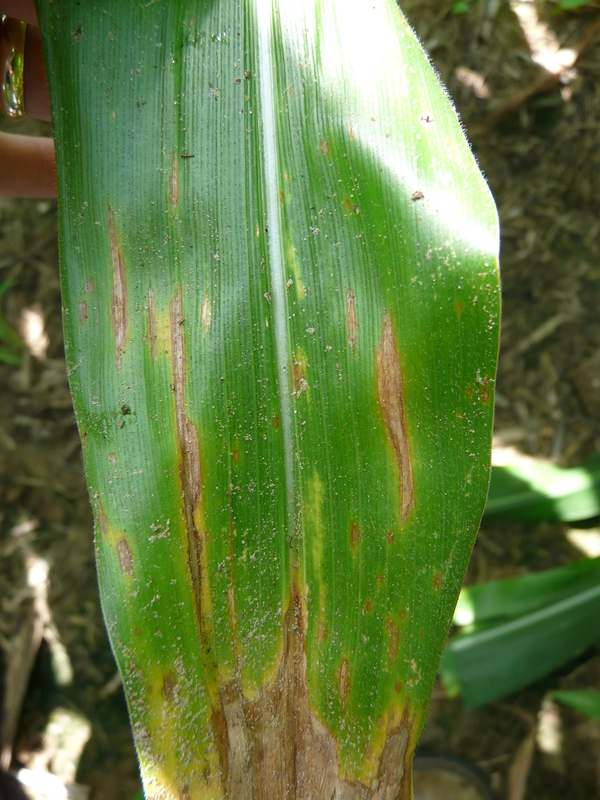 The photo below resembles Northern Corn Leaf Spot, not blight, and is not an issue or anything to be concerned.